Surviving letter correspondence provided by National5 infers there was interest on the part of University students, in Delta Sigma Phi,6 prior to early November, 1949. On November 8, 1949, the University's Dean of Student Welfare wrote Francis Wacker, Executive Secretary, Delta Sigma Phi, that “the interested parties on campus” had requested that the Dean inform him that the college had been accredited. The Dean added that the matter of social fraternities was on the agenda “since several interested groups have made request for official status”. “My good friend Chuck Dawe of Hilgard Chapter has kindled the fraternity urge in a group of us here. We are impressed with the record and standing obtained by Delta Sigma Phi, and would deem it a true privilege to be associated with such a fraternity. For these reasons we are contacting your fraternity before any others. It was a bitter pill we took when word came that our College could not be recognized by the National until we were accredited. I am happy to enclose a copy of the letter proclaiming our regional accreditation. Our Brothers of the 1950’s established our colony’s traditions of leadership, involvement, and scholarship on campus, unique fraternal functions, and philanthropic service to our community. They overcame a cascade of obstacles across years and established savings and building funds for future generations of Delta Sigs whom they would never know. In short, they invented the future. That same school year the colony leased and moved into 1134 Palm Street24 where it remained for 17 years. This Palm house photo is circa 1954. Although Poly’s Student Faculty Committee told our National Fraternity representatives in 1950 that “students were free to organize any kind of groups they wished,”30 the college’s President, Julian McPhee, in subsequent years took a different view. The College’s President from 1933 to his passing in 1967, he refused to grant any national social fraternity official recognition as an on-campus club.31 Without this recognition our organization had to remain a colony. In spite of the lack of official recognition by campus, the colony continued to take leading roles in campus affairs, clubs, events, projects, and provided more than its share of campus leaders.39 Many years the colony had 100 members, more than most Delta Sig chapters. In 1961 the colony was the sole, and winning, bidder on the 1923 American Le France #49 fire engine from Baywood Park fire department. The bid was $100. It needed a lot of work, and for a time, it sat. It came with helmets! The second half of the 1960’s was influenced by the Vietnam War. Major David Royce Kingsbury was in the colony’s class of S’54. 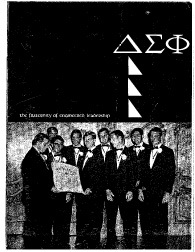 In May of 1967 the “Delta Sigma Phi Colony” at California State Polytechnic College formally petitioned National to become a chapter.51 It was signed by colony President Ken Francis and Secretary Richard Burton. This document is attached and is worthy of reading. It presents, to that point in time, the history and current state of the University, the colony, and the fraternity system. At this time there were 9,583 students at the University: 2,750 women, 6,833 men, and social fraternities had 280 members with 81 pledges. There were three other national fraternities (Alpha Epsilon Pi, Delta Chi, and Phi Kappa Psi), four local fraternities (Alpha Sigma, Alpha Tau Omicron, Alpha Upsilon, and Kappa Chi), and one local sorority (Delta Chi Omega). “Members of the local colony of the Delta Sigma Phi have inquired whether or not the college would object to the colony acquiring Chapter status within the fraternity. As you may know, the college does not recognize social fraternities at the present time. Consequently the college would not have any objections to the change of status from colony to chapter. Even though the college has not recognized social fraternities, the relationship between the students in the Delta Sigma Phi Colony and the college as (sic) been amiable. And so a gentlemen’s agreement was reached between the National Fraternity and the University. The Chapter in San Luis Obispo would be chartered without officially being recognized on campus. Then that long-awaited day was scheduled when the oldest colony in the Fraternity’s history, the first fraternity at the University, an organization that had initiated over 500 Brothers53 across two decades of challenges, was to be installed as the Delta Sigma Phi Chapter in San Luis Obispo! Consistent with our history, it had to be delayed. The date on the charter is January 25th but a flood of Biblical proportions stranded National Council members in Ventura while on their way to the colony. The installation and celebration were finally held April 26, 1969, in San Luis Obispo. Our third decade at the University was to again test our faith in, support for, and loyalty toward our DSP program. An alumni architect, Steve “Muther” Hubbard, F’64, generously donated his professional services and drew up the plans for 244 California.57 Lending institutions were reluctant to loan money to fraternities and, as a result, the house was designed as a commercial apartment building to provide additional assurances should the chapter fail.58 The chapter had increased equity in the 244 California property to use as a down payment but this was not enough. At present there is some disagreement over details surrounding if our lender, Great Western Savings, required additional alumni to co-sign, or guarantee, the construction loan. It is thought that John Kerr, S’58, Carl Cowan, W’56, and three others acted as guarantors. We wish to verify and preserve our history – if you have any authoritative information on this subject please contact us. As graduation 1971 approached the Brotherhood prepared to move out of their home of 17 years. “The house started taking down everything that people felt was of historical value in anticipation of the move to California. I think commencement exercises that year were on a Thursday, June 10, 1971. 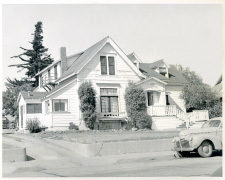 The day after graduation, I went by the house and it was already a pile of wood – bull dozed.”59 Brothers, knowing the house was to be razed and an apartment building put up in its place, held one last party – a demolition party! The original house did not have the attached shed. This was built by active members after moving in. The problems of transition did not end with moving-in. In 1976 the chapter purchased and installed a large redwood hot tub and decking that became very popular. In our fourth decade, we continued our tradition of involvement on campus and in the community. As required by National in the mid-‘80’s, the Chapter in San Luis Obispo altered its pledge program to conform to new Fraternity guidelines. While the University experienced growth in student population, many new large national fraternities created increased competition. This unusual class initiation photo is from Spring 1981. The two house dogs were “Ralph”, our first St. Bernard, a Little Sister’s gift in 1973, and “Barney”, our second St. Bernard. Ralph’s SAT scores were higher.64 The following photo is of Barney. Early in the 1980’s the chapter’s three-and-a-half decade tradition of one pledge class per academic quarter was modified. In place of three classes per school year the fraternity decided upon two longer classes per school year. Winter pledge classes were ended and the remaining Fall and Spring class members were given more time to balance pledgeship with college requirements. The chapter took an increased interest in pledge scholarship. The 1980’s saw the return of the Sailor’s Ball. At the Univerity, the traditional return of alumni to their alma mater, and of Delta Sigs to their chapter’s twice-a-year ACB meeting, used to be in Autumn at Homecoming and in Spring at Poly Royal. After the 1960’s, by far the greatest return of alumni, and Delta Sigs, occurred in April at Poly Royal, the equivalent of a three-day, university-wide, open house. 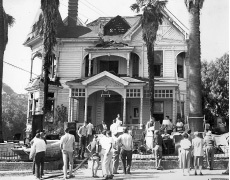 In April, 1990, during Poly Royal, riots attributed to outsiders occurred in SLO. The Univerity’s President Baker banned this function until its disgrace was no longer a part of student memory. An unforeseen casuality of this decision was the return of Delta Sig alumni to the Chapter in San Luis Obispo. For nine years, between April 1990 and April 1999, except for 4-6 ACB officers, Delta Sig alumni did not return to the Univeristy nor their chapter. Broad alumni oversight of the chapter, guidance to ACB, and multi-decade perspective was absent. As a result the chapter program suffered. A Brother writes of the beginning of this decade. The number of initiates per year is only one of several measures of chapter health. While it doesn’t measure qualitative aspects it does point to trends. According to National records,76 from 1975 to 1990 the Chapter in San Luis Obispo initiated 334 men, an average of about 21 per year. The next five years, 1991-95, the yearly average was 15. The following four year period, 1996-1999, the average dropped again to less than 11 men per year. The last two years of this period, 1998 and 1999, the average was 7 initiates. The call went out to alumni that ACB needed their support and the chapter needed their attention. As a result, and in combination with the engineering of a 50 year celebration of being at the University, 118 alumni were drawn back in April, 1999. This began the process of re-introducing a multi-decade perspective. Had there not been as many quality undergraduate Brothers across the 1990’s with high loyalty to DSP, and diligent but lonely ACB officers, increased competition and nine years of alumni absence could have cost us the program. Subsequent to the mass return of alumni in April 1999, and mostly prior to the re-establishment of the Alumni Association across 2000-2001, concerned alums took independent action to strengthen their chapter. In great numbers they made it a point to regularly visit the chapter, listen to the actives, and answer questions of what it had been like to be a Delta Sig in their era. The Alumni Association was populated with officers in 2001. The combined attention of the ACB, the Alumni Association, alumni at large, and undergraduate Brothers produced results. The average number of initiates in 1998 and 1999 had been 7 per year. After alumni re-involvement, and primarily due to the hard work of our undergraduates, an average of 22 men per year were initiated in 2000 and 2001. This trend has continued, at 21 per year, as of 2008. Just as the undergraduates of the 1970’s met the challenges of transitioning the fraternity between two chapter houses, so the undergraduates in the new century met the challenge of transitioning the chapter between two programs. The fraternity saw some significant changes from 2001 to 2005. When I was initiated, we had a small house of under 30 brothers, and there was a great effort to increase our numbers. Controversially, we accepted more pledges than we probably should have. Between two pledge classes (2001-2002) we had almost 45 new brothers. We had good numbers, nearing 80 at one point, … and were more competitive…..and the future looked bright. Many didn’t understand the values of a Delta Sig and many were just looking for a place to party. Our fraternity had a major identity crisis. A number of cliques resulted. Unity and cooperation became an issue. (As a result of) the biggest party in the chapter’s history, in May, 2004, we were put on probation by the University and our national board. We had to face the harsh reality of being completely dry until 2005 with new alcohol rules imposed on us, quiet hours, and social events at a bare minimum and far from the house. During that time interest in fraternity events and the pledge program waned. Many actives did not like this (dry house probation) and in turn stopped coming around. Many actives wanted to disregard the punishment and continue business as usual. There was a lot of hardship and heartache. I didn’t want to be the President that lost the charter. I give credit to others in the house at the time that … helped enforce the rules. The ones that stuck around grew stronger and closer. They molded the new pledge classes into like-minded brothers and in the end the fraternity sifted out the actives that had joined Delta Sigma Phi for all the wrong reasons and retained the brothers that had values true to a Delta Sig. DSP was better in January 2005 than it was in May 2004, even if it was a bit smaller in size. The next president ushered in this new fraternity and continued to make it better. By 2006 and 2007, DSP was again the prominent fraternity on campus and was still growing in size and respectability. Had this gone the other way and the chapter … (not accepted) the probation it (the house) may have been lost. ACB and the actives decided to renovate. The house renovation of the six suites and bathrooms, chapter room, and kitchen, that took place from 2002-2004, turned around the attitude that people had towards the house. With the newness of the house came more stringent rules and regulations that were upheld (by officers). The renovation carried a contagious energy ….. and we all held each other responsible for cleaning up after ourselves. In the end there was a fresh house that was filled with pride, and it again became a place people wanted to be. 1 CARNATION, Delta Sigma Phi, Summer edition 1969. 2 Letter to Julian McPhee, December 1948. 4 Tom Wible, Delta Sigma Phi, Director of Chapter Services. 5 Tom Wible, Director of Chapter Services, Delta Sigma Phi Fraternity, 7/16/08 email. 6 Letter 11/8/1949, V. H. Mescham, Univeristy Dean of Student Welfare, to Francis Wacker. 7 Letter, 11/10/1949, A. Dean VanZant to Francis Wacker. 8 Letter, 12/17/49, Francis Wacker to V. H. Mescham, University Dean of Student Welfare. 9 Tom Wible, Directory of Chapter Services, email, 7/10/08. 10 Colony Petition to National For Charter, File “1967 Charter Application to National,” Pages 10 and 11. 11 National award winner of Mr. Delta Sig Award and the Harvey H. Hebert Award, per Tom Wible, National. 12 At the time, the Executive Secretary of National. 13 National Field Representative for Delta Sigma Phi Fraternity. 14 Colony Petition to National For Charter, File “1967 Charter Application to National,” Pages 10 and 11. 18Interview With Ira “Dad” Schab. 19Petition to National For Charter, File “1967 Charter Application to National,” Pages 10 and 11. 20Based on DSP scrapbook newspaper clippings and notes to photos. 21Telegram Tribune Article, Date uncertain, found in scrapbook. 22Petition to National For Charter, File “1967 Charter Application to National,” Pages 10 and 11. 23Petition to National For Charter, File “1967 Charter Application to National,” Pages 10 and 11. 24The exact date of moving into 1134 Palm is not known at this time. 29Petition to National For Charter, File “1967 Charter Application to National,” Pages 10 and 11. 41“1961 Deed of Trust.jpg” and “1961 Deed of Trust (2).jpg”, 5/31/1961, Book 1129, Page 46. 45Telegram Tribune Article, date uncertain, found in scrapbook. 46Telegram Tribune Article, date uncertain, found in scrapbook. 47Telegram Tribune Article, date uncertain, found in scrapbook. 48Telegram Tribune Article, date uncertain, found in scrapbook. 64Yabut, I knew them both. 681981 Mustang Daily article, “Pro-“P” Faction Dresses Up Hillside Initial”. 72Letter, Fred Genthner to Scott Kelly, 1981. 73Letter, Mark Kelly to Mr. Genthner, Robert E. Kennedy Library, forwarded to Dr. Kennedy Barclay, Director Activities Planning Center, presumed 1981-82. 76Excel file, received 7/10/08, renamed “DSP Web Site Initiates By Year From National.xls”. 77Doug Meyer, S’93, Beetle, “DSP Web Site Recollections”. 81“DSP Web Site 2000 10 21 Open Letter To ACB”, presented at Homecoming 2000 ACB meeting by Chris “Yabut” Patterson.